Wilfred Bion’s theories of dreaming, of the analytic situation, of reality and everyday life, and even of the contact between the body and the mind offer very different, and highly fruitful, perspectives on lived experience. Yet very little of his work has entered the field of visual culture, especially film and media studies. Kelli Fuery offers an engaging overview of Bion’s most significant contribution to psychoanalysis- his theory of thinking- and demonstrates its relevance for why we watch moving images. Bion’s theory of thinking is presented as an alternative model for the examination of how we experience moving images and how they work as tools which we use to help us ‘think’ emotional experience. ‘Being Embedded’ is a term used to identify and acknowledge the link between thinking and emotional experience within the lived reception of cinema. It is a concept that everyone can speak to as already knowing, already having felt it - being embedded is at the core of lived and thinking experience. 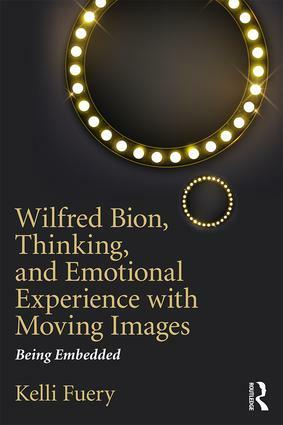 This book offers a return to psychoanalytic theory within moving image studies, contributing to the recent works that have explored object relations psychoanalysis within visual culture (specifically the writings of Klein and Winnicott), but differs in its reference and examination of previously overlooked, but highly pivotal, thinkers such as Bion, Bollas and Ogden. A theorization of thinking as an affective structure within moving image experience provides a fresh avenue for psychoanalytic theory within visual culture. Kelli Fuery is Assistant Professor at Dodge College for Film and Media Arts, Chapman University, USA. She is the author of New Media: Culture and Image (2009) and co-author of Visual Cultures and Critical Theory (2003). She has also published widely on the themes of visual culture, psychoanalysis and critical theory.